I would like to encourage Indigenous peoples to tell their stories, whether its through writing or painting, or dance, music or theatre. We can all learn from each other and it helps to build the bigger picture. The School of Indigenous Studies is committed to Indigenous-led, quality research that makes a positive contribution to both the Indigenous and academic communities. The Centre for Indigenous History and the Arts (CIHA) was an Indigenous Research Centre established in 1997 that now forms part of the School of Indigenous Studies on campus at the University of Western Australia. Based on the foundation established by CIHA, as well as the expertise of Indigenous staff, the research focus of the School is to ensure that Indigenous oral traditions and cultural expressions are supported, properly recognised and valued for the rich and unique contribution they make to all fields of study. Group-based exhibitions which support historical and social justice issues. International cultural exchanges and audio-visual telecommunication link-ups. Teaching, workshops and public forums. Oral history and arts conferences. Consultancies and training relation to historical and legal research, cross-cultural awareness, arts and curriculum development. Research ethics and intellectual property issues for universities. Community training projects in research and oral history. The National Empowerment Program is a universal strategy to promote social and emotional wellbeing and reduce community distress and suicide in Aboriginal and Torres Strait Islander communities. 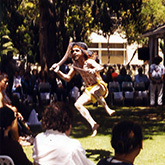 Funded by the Commonwealth Department of Health and Ageing, the project builds on an Australian Research Council Indigenous Discovery Grant, Cultural Continuity and Change: Indigenous Solutions to Mental Health Issues and the Kimberley Empowerment Project, which was a response to a rise in the suicide rate within that region. Through the development of a culturally appropriate and locally responsive empowerment, healing and leadership program, the National Empowerment Project aims to restore the social and emotional wellbeing of communities by enabling communities to regain their resilience and to provide an environment which supports the recovery and healing of community members. For more information, please visit the Project's website. Southwest Australia is Nyungar country and over 50% of town names as well as countless other geographical features are Nyungar; however, few people know what they mean. This research, funded by the Australian Research Council, will document Nyungar place names and their meanings from a range of sources – historical maps, explorers' and surveyors' journals, ofﬁcial cartographic material and primary Nyungar sources. The research will assemble information, create meaning and a deep sense of place using a range of formats including books, papers, conferences, websites and ﬁlms. This research intends to cover the whole of Nyungar country, which extends from Perth across to Merredin, all the way down to Albany, then up the lower coast of Western Australia including Bunbury, Busselton and then back up to Perth. This entire area is known as Nyungar Boodjar to the Nyungar people. For this project, the Nyungar Boodjar is divided into 13 distinct but interconnected language regions: Wudjari, Koreng, Pibelmen, Wardandi, Ngakinjaki, Balardong, Juat, Amangu, Minang, Kaneang, Wilman, Pinjarup and Kaneang. For more information, please refer to the University press release, featuring an interview with Research Fellow Professor Len Collard.